When connecting to a remote computer via Remote Desktop Connection (RDC), the Windows operating system will lock the local session on remote computer’s console who is logging in with the same user account, interrupting user who is physically using the server or client computer. 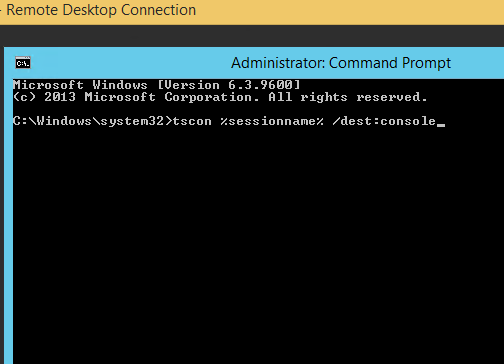 To make matter worse and the RDP behavior more annoying, Windows won’t automatically release the lock on the local session on console screen to show the desktop upon termination of Remote Desktop Connection. This creates problem for people who needs the local user logged in to be always unlocked and stay logged on, especially for administrator or user who doesn’t have physical access to the remote computer. If you need to unlock the remote computer after closing the Remote Desktop Connection, here’s a trick which you can use to force RDP to disconnect without locking the session and logged local user back in on the local console screen upon disconnection of Remote Desktop Connection. On the remote system connected through RDC (not on your computer which RDC is initialized to connect to remote system), open a Command Prompt window as administrator, then run the command depending on the Windows operating system that is running on the remote system.